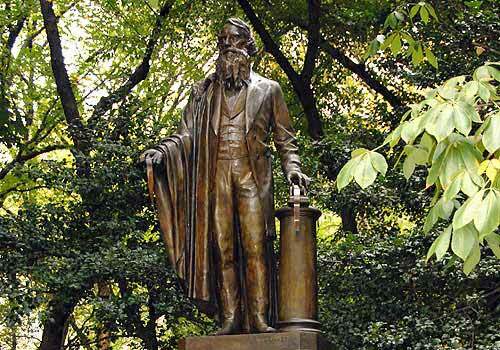 This statue of the famed inventor of the wire telegraph stands at Inventor's Gate, on Fifth Avenue and 72nd Street. It is one of the only statues in the Park that memorializes the profession of the named gate (the other is Alexander Von Humboldt at Naturalists' Gate). The 1871 monument by sculptor Byron M. Picket depicts the inventor standing with one hand resting on his single-wire telegraph, while the other holds out a scroll bearing its Morse code. The statue was originally on the Mall, close to the Concert Ground and moved in 1985. Inventor's Gate entrance, East Side at Fifth Avenue and 72nd Street.